New snow over the weekend (while I was off the trail to take care of business) returned the Roan Highlands to winter, and it seems reluctant to let go. The difference is purely due to elevation. Below 5000 feet much less snow fell in the first place, and there was more melting. Down in the valleys the warm late February sun made for a mild day today - Do I hear murmurs of spring fever? 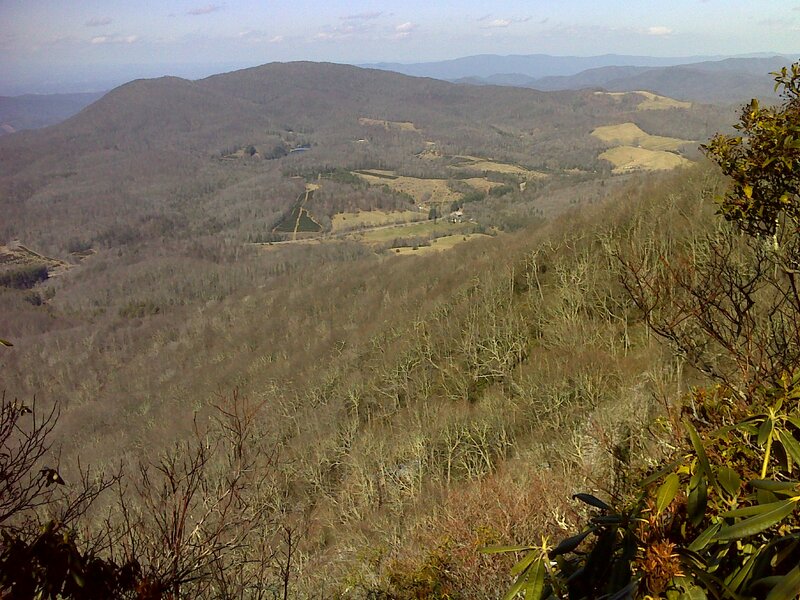 Roan High Knob is the last super-high peak I'll cross for the next 75 miles or so of trail. Then come the Smokies. I'm optimistic that winter will be seriously retreating by the time I get there. Between Roan High Knob and Little Rock Knob is Hughes Gap where a road crosses the trail and there is parking access. 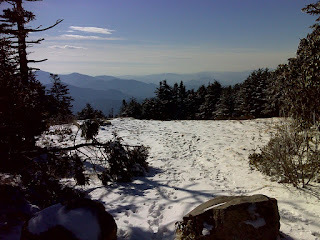 The ascent northbound from 4040 foot Hughes Gap to 6285 foot Roan High Knob is an interesting piece of trail. Currently it's an ordeal to go either way. It's one of those sections of old, horribly eroded, rutty, rooty, muddy, and very steep trail that has outlived its usefulness. 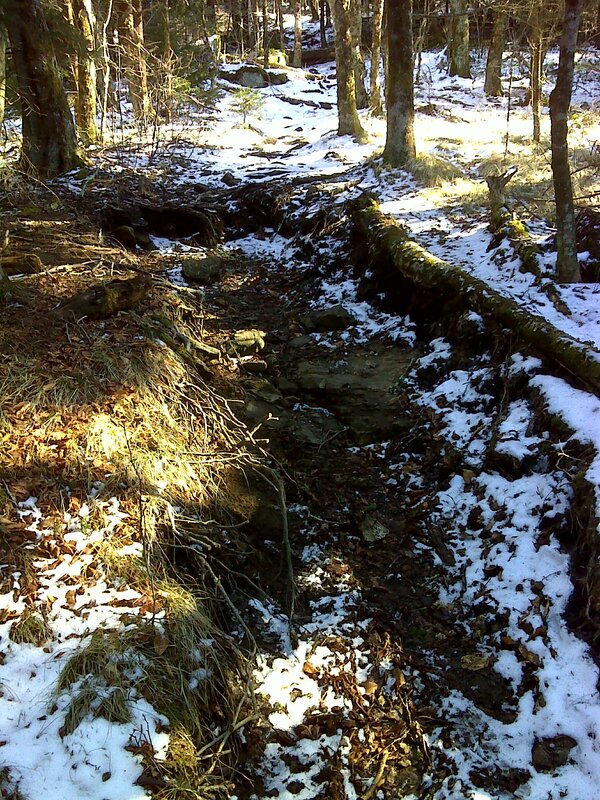 But here's the latest news: The entire section above 4600 feet is actively being relocated with graded switchbacks replacing the 'Rip straight up the ridge' old trail. 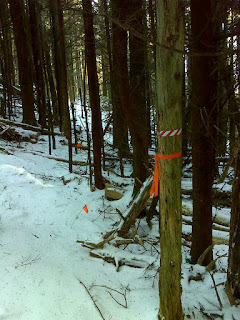 Below Ash Gap (a pause in the climb at 5300 feet) I saw two sections of planned relocation marked with flag tape. Above Ash Gap the entire trail to the summit is in various stages of active relocation. 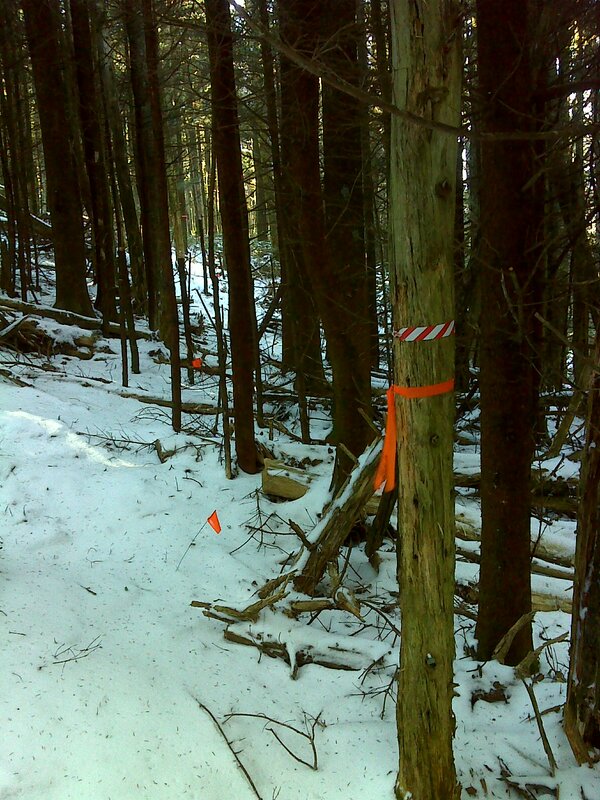 A few new sections are already open, and there are a few short bits of old trail, on less-steep sections, that are being retained and upgraded. But new trail is in the works everywhere else. 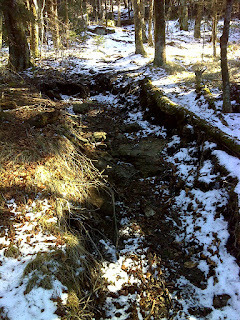 I counted 8 crossings of planned new trail, switching back-and-forth across the grueling old route. Some of these have been partially cleared, others are just flagged. The current map appears to show the old trail - very straight up the ridge, but the new trail will be quite a bit longer, with a dozen or more switch-backs. Oh, you lucky future hikers!